The 'Outdoor' part of this Flash drive's name is justified by the thick rubber coating. It's made for considerable wear and tear. So, to really put it to the test, we splashed it, dropped it, threw it, chewed it and it still worked perfectly well. Okay, so we didn't actually chew it, but you get the point. 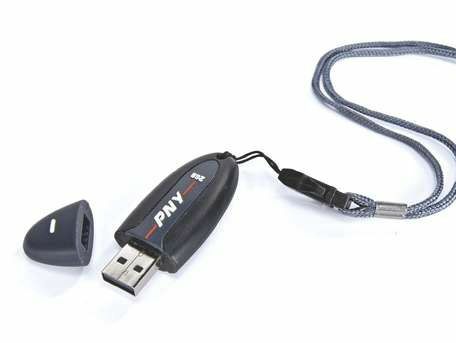 USB drives like this one from PNY are home and office essentials; they're extremely handy for swapping files between computers, and a chunky 2GB one that will slip in your pocket is a desirable tool. The problem is that USB is a slow standard for transferring big files, and when you buy 2GB-worth of pocket storage you're probably planning to shift some hefty material. A drive with a FireWire port will transfer in a fraction of the time, or if you have a .Mac account you can always drop things into your iDisk account. There's also no encryption for the Attache Outdoor, so it's not secure storage. That said, we've used this drive again and again. iDisks or FireWire-ported drives may be faster, but they tend to be bigger - and not as 'pocketable' as the Attache Outdoor.